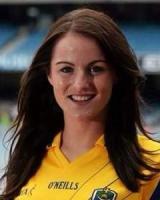 Captain Profile Name: Jennifer Higgins Club: Western Gaels Position: Midfield Age: 23 Ladies Gaelic Football Achievements Toughest opponent: Laura Fleming When did you start playing Ladies Gaelic: At the age of 8/9 High point of your career to date: Captaining the Roscommon Intermediate team and my Club team Western Gaels this year Biggest disappointment: Not making the Connacht Final this year with Roscommon â€“ I felt we had the ability Favourite Player: Female:	Caroline Oâ€™Hanlon Male: Kevin Higgins Most embarrassing moment on or off the field: On the field (I think all of Roscommon know about this one) in extra time of the Junior County Final replay a few years back, I won the ball from the throw in and went on a solo run â€“ in the wrong direction. Still get reminded of it today. Favourite food: Too many to decide Nickname: Jenny or Higgi Favourite ground: Nash Park - Frenchpark Favourite ladies gaelic football skill: Outside of the boot pass or score. Person you would most like to meet: Katie Taylor One rule you would change in our game: I think there should be a much harsher punishment for a pull down when you are straight through on goal. Some referees give a sin bin from it, some donâ€™t and I feel some teams take advantage of this. Possibly a black card like the menâ€™s for it maybe. Influences on your career: My brothers have possibly had the biggest influence on my career as, being the youngest and only girl, I always looked up to them growing up and probably wouldnâ€™t be playing if it wasnâ€™t for them. My supportive parents, friends and boyfriend also have had a huge influence on my career and of course all the coaches I have had over the years.